British architect John Pawson has sent us these snaps of the model he used when designing the forthcoming exhibition of his work at London's Design Museum, which opens next week. "Through the exhibition the viewer will get an in-depth look at my design process - from sketches and study models right through to a full scale installation," says Pawson. "A series of large-scale photographs explore the relationship between my architecture and the landscape, while actual architectural elements in stone, bronze, wood and metal examine the combination of materials. Films, interviews and personal items from my archive will also be on display including letters from Karl Lagerfeld and the writer Bruce Chatwin." More behind-the-scenes information about the exhibition on Pawson's Plain Space blog. "The father of modern architectural minimalism"
The Design Museum presents a major exhibition of the work of British architect John Pawson. Often described as a 'minimalist' he is known for a rigorous process of reduction, that creates designs of simplicity, grace and visual clarity. At the heart of the exhibition is a site-specific 1:1, full-sized installation designed by Pawson to offer a direct experience of his work - the first such installation at the museum. 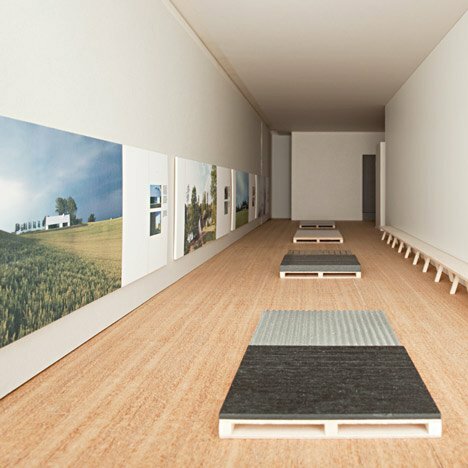 Plain Space celebrates Pawson's career to date with models, film, photographs and architectural elements and includes some of his most important projects including the Cistercian Monastery of Our Lady of Nový Dvůr in the Czech Republic, the Sackler Crossing at the Royal Botanic Gardens, Kew and the Calvin Klein store on Madison Avenue, New York.